For high-energy particle physics, particle accelerators help string theorists proceed with experiments in apparatuses that they control. A particle accelerator is a device that uses powerful magnetic fields to accelerate a beam of charged particles up to incredibly fast speeds and then collides it with a beam of particles going the other way. Scientists can then analyze the results of the collision. 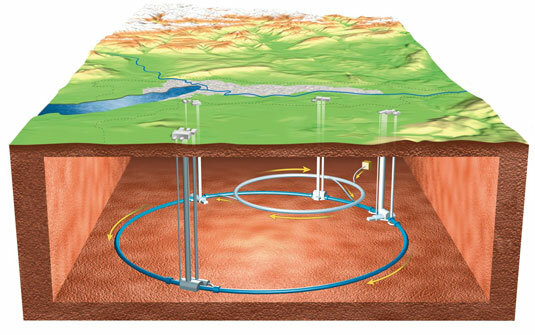 The Relativistic Heavy Ion Collider (RHIC) is a particle accelerator at Brookhaven National Laboratory in New York. It went online in 2000, after a decade of planning and construction. The RHIC name comes from the fact that it accelerates heavy ions — that is, atomic nuclei stripped of their electrons — at relativistic speeds (99.995 percent the speed of light) and then collides them. Because the particles are atomic nuclei, the collisions contain a lot of power in comparison to pure proton beams (though it also takes more time and energy to get them up to that speed). By slamming two gold nuclei together, physicists can obtain a temperature 300 million times hotter than the sun’s surface. The protons and neutrons that normally make up the nuclei of gold break down at this temperature into a plasma of quark and gluons. This quark-gluon plasma is predicted by quantum chromodynamics (QCD), but the problem is that the plasma is supposed to behave like a gas. Instead, it behaves like a liquid. According to Leonard Susskind, string theory may be able to explain this behavior using a variation on the Maldacena conjecture. In this way, the quark-gluon plasma may be described by an equivalent theory in the higher-dimensional universe: a black hole, in this case! The Large Hadron Collider (LHC) is a massive apparatus, built underground at the CERN particle physics facility on the border of Switzerland and France. (CERN is the European particle physics center that was, in 1968, the birthplace of string theory.) The accelerator itself is about 27 kilometers (17 miles) in circumference, as shown. The 9,300 magnets of the facility can accelerate protons into collisions up to possibly 14 trillion electron volts (TeV), well beyond our current experimental limitations. The cost of the LHC was around $9 billion as of this writing. On September 10, 2008, the LHC came online by officially running a beam the full length of the tunnel. On September 19, a faulty electrical connection caused a rupture in the vacuum seal, resulting in a leak of 6 tons of liquid helium. One of the greatest pieces of evidence for string theory could actually be a lack of evidence. If the experiments at the LHC register some “missing energy,” a couple of possibilities could provide amazing support for string theory. First, the collisions could create new sparticles that form dark matter, which then flows out of the facility without interacting with the normal matter (like, you know, the detector itself). Second, missing energy could result from energy (or sparticles) that are actually traveling directly into the extra dimensions, rather than into our own 4-dimensional space-time. Either of these findings would be a great discovery, and either the supersymmetric particles or extra dimensions would have profound implications for string theory. Particle accelerators are so massive that there are no set designs for them; each particle accelerator is its own prototype. The next one on the books appears to be the International Linear Collider (ILC), which is an electron-positron collider. One benefit of this is that electrons and positrons, because they’re fundamental particles and not composite particles like protons, are a lot less messy when they collide. The ILC has not been approved. Proposals, including location, could be voted on around 2012 and, if approved, it could be running in the late 2010s. Early estimates for the project give a minimum cost of $6.65 billion (excluding little things like actually buying the land and other incidental costs). It’s also possible that the LHC might be the last of the large particle accelerators, because new proposed technologies may be developed that allow for rapid particle acceleration that doesn’t require massive facilities.